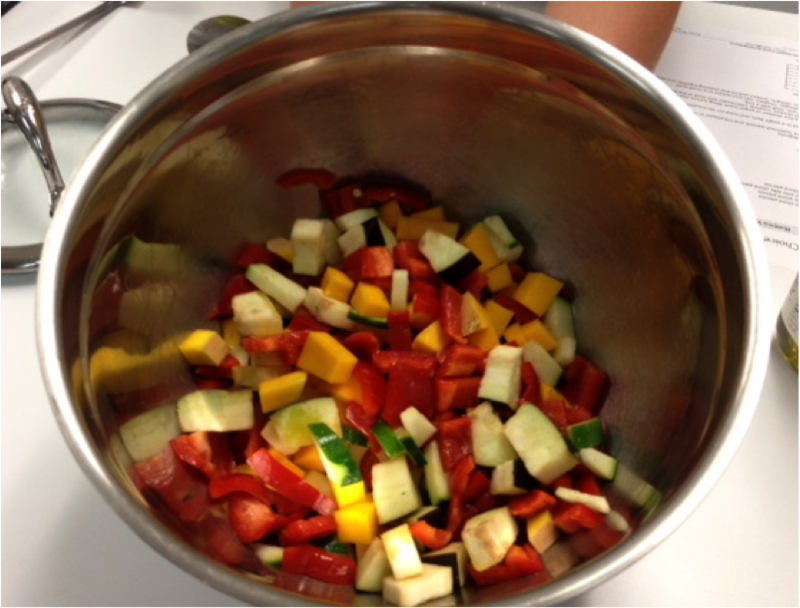 Did the class Healthy Cooking on a Budget fill up before you got a chance to register? Well have no fears! I’m here to give you the inside scoop along with a delicious SCNC recipe! 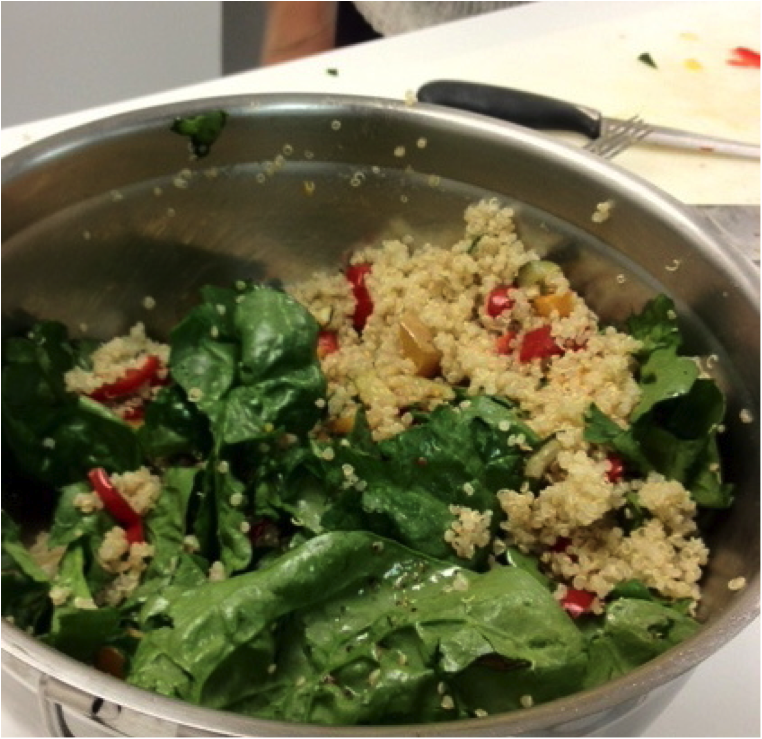 Lauren focused on the importance of whole grains and cooked up a Roasted Vegetable Quinoa Salad at the first cooking demo of the semester. This delicious recipe costs only $10 for 4 servings. That’s only $2.50 per serving! 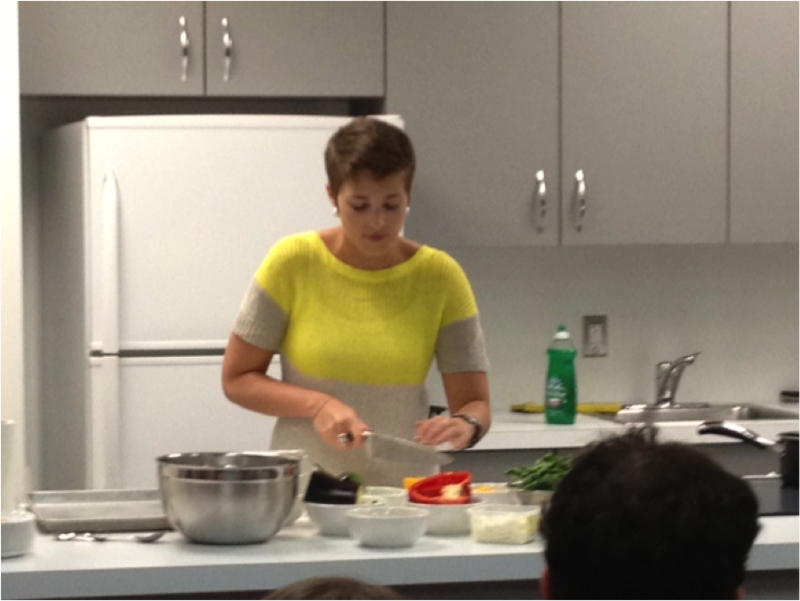 As an RD, Lauren loves quinoa because it is a versatile source of whole grains. Whole grains, such as quinoa, contain all 3 parts of the grain including the germ, endosperm and bran of the grain. With the 3 parts present, quinoa offers vitamins, nutrients, fiber and even antioxidants that refined grains lose in processing. Quinoa is also a “complete protein” meaning it provides all 9 of the essential amino acids that the body cannot make on its own. Lauren points out that quinoa is more expensive than other whole grains, but it’s worth your money because the grain triples in size after it’s cooked! Quick Tip: Don’t forget to rinse your quinoa before cooking to avoid a bitter after taste! 1. Leave the peel on! Nutrients begin to diminish the moment a vegetable is chopped and exposed to oxygen through a process called oxidation. Chop vegetables as close to cook time as possible to reduce oxygen exposure time and nutrient loss. Raw vegetables contain the most nutrients. Generally, the longer you cook vegetables, the more nutrients are lost. Avoid over cooking and get the most nutrients for your dollar! How should you cook your veggies? Generally, steaming vegetables retains the most nutrients and boiling vegetables results in the greatest loss of nutrients. Lauren advises to steam veggies whenever possible. But if you must boil your vegetables, you can consume the lost nutrients by using the broth to cook other parts of the entrée. For example, use the broth from the boiled vegetables to cook rice or any other grain. The grain will then absorb the nutrient-rich broth and the nutrients will be consumed instead of wasted. Toss zucchini, eggplant, butternut squash and red pepper in olive oil, salt and pepper. Place on a baking sheet in a single layer and roast for 30 minutes, flipping after 15 minutes. Rinse quinoa through a fine strainer or paper towel. Bring quinoa and liquid to a boil. Reduce heat to low and simmer, covered, until tender and most of the liquid has been absorbed, 15-20 min. Fluff with a fork. Toss roasted vegetables, spinach, cooked quinoa and dressing together in a large bowl. Enjoy! Great tips for cooking :). I’ll try these tips to keep the nutrients in every ingredients I use for cooking.